Volcanic explosions don't only throw up a lot of dust and kill thousands of people. Even two years after a flare-up, weather patterns in distant places can be affected. A VOLCANIC explosion does not affect only those living in the vicinity -- it's impact can be global and it may be felt for years afterwards. A volcanic eruption can cause unexpected changes in the earth's climate and environment and the onset of the Ice Age, global cooling, depletion of atmospheric ozone and the warming of the lower stratosphere are some examples of the long-term effects of such eruptions. When the volcanic island of Krakatoa near Java blew up in 1883, it triggered a huge tsunami (wave), which killed more than 36,000 people in Java and Sumatra. The explosion was heard 4,000 km away in central Australia and dust from Krakatoa lingered in the upper atmosphere for years. 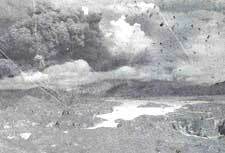 In 1902, Mt Pelee in the West Indies erupted, destroying the city of St Pierre and its 30,000 inhabitants. Now, however, scientists are able to record changes in the earth's temperature, climate and ozone layer probably resulting from eruptions such as those in 1991 by Mt Pinatubo in the Philippines and Mt Hudson in Chile. As major sources of heat-retaining carbon dioxide, volcanoes are natural sustainers of global warming -- the greenhouse effect. Recently, scientists discovered volcanoes need not erupt spectacularly to spew carbon dioxide into the atmosphere. A French team led by Patrick Allard found that Mt Etna, an active but relatively subdued volcano in Sicily, has been quietly pumping 25 million tonnes of invisible carbon dioxide into the atmosphere each year, "making up for the natural weathering processes that remove atmospheric carbon dioxide". Recent studies also suggest volcanic eruptions are largely responsible for annual climatic changes in the northern hemisphere over thousands of years. The evidence shows about 73,500 years ago, an eruption in Sumatra sent massive amounts of volcanic material shooting 25 km into the air, reducing sunlight levels for years and cooling the northern hemisphere by 3-5o C. US scientists M R Rampino and S Self note, "This 'volcanic winter' may have accelerated the onset of the last great Ice Age." Other studies indicate the 1815 volcanic eruption in Tambora, Indonesia, ushered in a "year without summer" in North America and Europe. Atmospheric interference Climate changes occur because eruptions alter the amount of atmospheric solar radiation and infrared radiation (electromagnetic radiation with wave-lengths between those of visible light and radio waves). In addition to lava, ash and dust particles, a volcanic explosion emits high into the atmosphere varying amounts of gases such as chlorine, carbon dioxide and, in particular, sulphur dioxide. After the Mt Pinatubo eruption in June 1991, for instance, satellites detected volcanic material at altitudes upto 40 km. The worldwide dispersal of volcanic particulates depends on the amount of sulphur gases and water vapour emitted, the process of particle coagulation and on wind patterns. At Mt Pinatubo, the sulphate particles were concentrated initially over the tropics, and then spread within months from the southern to the northern hemisphere. These volcanic particulates cool the troposphere (the atmospheric layer 6-10 km above the earth's surface) temporarily, but warm the lower part of the stratosphere (the layer that is 10-50 km above the earth's surface). Most of the heavier volcanic dust falls from the stratosphere in a few months. However, sulphur dioxide gets super-cooled at altitudes of 20-25 km and stays on in the air, combining with water vapour to form tiny droplets of sulphuric acid. These condense in the stratosphere into very small, light particles called aerosols, which remain in the atmosphere for upto 3 years and then fall as acid rain. Explains Pat McCormik of NASA's Langley Research Centre, "The sulphuric acid absorbs infrared light radiated by the earth's surface, warming the stratosphere by 3-3.5o C. The aerosols, on the other hand, cool the ground by intercepting and reflecting back into space a fraction of the sunlight. While the high-altitude warming is short-lived because one-third of the sulphuric acid droplets are cleansed from the atmosphere within a year, the cooling on the ground lasts longer." After lying dormant for 635 years, Mt Pinatubo pumped 15-30 million metric tonnes of sulphur dioxide and other material into the stratosphere -- the maximum volcanic emission this century. The result is, according to McCormik, stratospheric dust and aerosols increased by 60-80 times. Now, using atmospheric computer models and satellite observations, scientists predict a consequence of the eruptions of Mt Pinatubo and the smaller Mt Hudson is that the earth will cool substantially over the next three years. The Mt Pinatubo-induced cooling -- a dramatic 0.5o C drop in temperature -- is expected to begin this summer and continue till 1994. It will temporarily reverse global warming, caused by the greenhouse effect and by the El Nino current in the Pacific Ocean, occurring every 3-5 years and warming the atmosphere and influencing weather patterns. Though a general cooling from Mt Pinatubo is predicted, the effects may not be uniform globally, says James Hansen, director of the Goddard Institute of Space Studies, New York. "A half-degree of cooling," he explains, "would knock the probabilities of a warmer-than-normal season back to what they were 30 years ago. But it doesn't guarantee that its going to be cool at a given place on the globe." Climate changes are generally limited to 2-3 years, quite short when compared to the effects of the depletion of atmospheric ozone due to volcanic explosions. There is disturbing evidence that Mt Pinatubo's sulphur aerosols are causing a 15-25 per cent depletion of the ozone layer at polar latitudes, as well as a drop in ozone levels in the tropics and possibly temperate latitudes. T Dreshler of the University of Wyoming and an American-Italian team have proved aerosols from the Hudson eruption worsened the ozone hole above the Antarctic. "The Antarctic ozone hole," says Dreshler, "previously formed at higher altitudes. It has been dramatically affected by aerosols released from the two volcanic explosions at altitudes below 13 km." While the lower stratosphere remained undisturbed earlier, about half of the ozone in a layer of 9-13 km was destroyed in September 1991 by chemical reactions involving volcanic material. Researchers of La Sapienza University in Rome and an Italian-Danish team say Mt Pinatubo's volcanic material affected half the ozone layer where it penetrated the Arctic stratosphere in thin layers at altitudes below 16 km. Sunlight returning to the northern hemisphere this spring will set off reactions that will cause the most severe damage yet to the Arctic ozone hole. In addition, atmospheric ozone will be endangered because sulphate aerosol particles will render ozone molecules more vulnerable to atmospheric chlorine and so to human-made chlorofluorocarbon molecules. US National Oceanic and Atmospheric Administration scientists in Maryland state: "The 50 per cent loss of ozone at low altitudes is equal to a 15 per cent loss of total ozone." While the direct victims of a volcanic disaster, such as the people of Zambales province in the Philippines where Mt Pinatubo is located, pick up the pieces of their lives and repair the damage, scientists are ready with explanations of atmospheric concerns. But, they can't offer remedial measures to help the local people.